Russia and India have been at the forefront of global efforts to save the tiger. They need to extend the same amount of energy and resources to protect increasingly endangered species of birds that use the Central Asian Flyway. Every October when the forests around the city of Khabarovsk are a riot of colors, the Amur falcon join a flock and begin a journey through Siberia and Central Asia to India and onwards to southern Africa. The winters of the Russian Far East are far too cold for the small and beautiful raptor. For thousands of years, these birds faced few obstacles on their migratory path to and from Russia. The advent of modern weapons and a regular autumn hunt in northeastern India became a major threat to the survival of the species. In 2012, tens of thousands of these birds were massacred in Nagaland and Manipur. In a rare instance of civil society and the government working together to stop this practice, tribal communities in the states were educated and persuaded to not trap or hunt the birds. An awareness campaign turned bird catchers into bird lovers. Over the last few years, a lake where the birds rest has become an eco tourism hotspot. In 2015, Nagaland even hosted its first Amur falcon dance festival. The Amur falcon is one of 143 species of birds, which breed in Russia and take the Central Asian Flyway to warmer environments during the winter. 81 of these species make their way to India including the Demoiselle crane, Pale harrier, Eastern Steppe eagle and the hoopoe. Many of these species stay in India for months in winter and can be found in all parts of the country. Where do the Russian birds migrate for the winter? 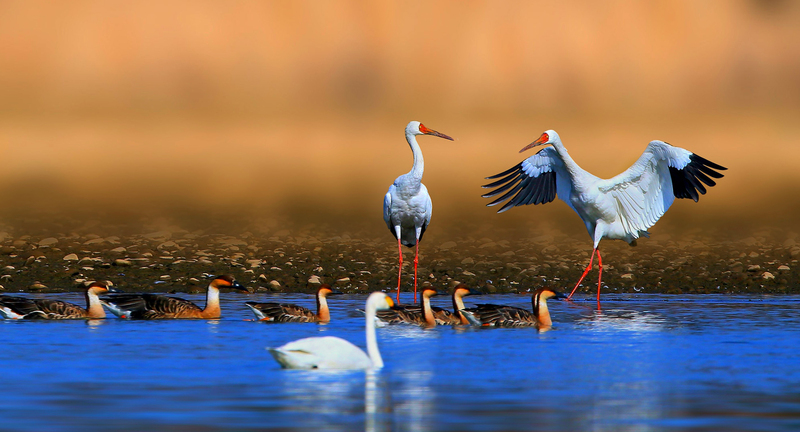 One of the main attractions at the Bharatpur National Park in Rajasthan was the majestic Siberian crane. However it’s been 16 years since the crane has been spotted in the park. Environmentalists say that the flock that headed to India is now extinct. Rahmani told the paper that the birds that made their way to India via Central Asia, Afghanistan and Pakistan were hunted in the Abd-I-Istada Lake in Afghanistan. Russia and India definitely have the money and expertise to try and teach the route of migration to the Siberian crane. Getting the birds back to India would be a great achievement. However, the countries like Afghanistan and Pakistan (where wealthy Arabs hunt birds as a hobby) are part of the problem and they very much need to be a part of the solution. Desai adds that the destruction of the natural habitat of the birds is also a major threat and that the responsibility to protect them lay with the governments of South Asian countries. A concerted effort and large-scale awareness in India helped the country save the tiger and increase the majestic cat’s population. Russia and India have been the main backers of the Global Tiger Recovery Program. Although not widely covered by the media, Indo-Russian cooperation in tiger conservation has been strong over the last decade and led to tangible results. Plans are on to make a global tiger atlas. A similar initiative and political will have to be demonstrated by the two countries to save the migratory birds, which are under a growing threat every year. Animals and birds have few rights, but they certainly have the right to exist. As countries with cultures that revere nature, the onus is on India and Russia to protect their common natural heritage.